Join us Saturday October 21st at Temescal Brewing Company in Oakland as we pop up with a group of other locally owned shops for a super sales shopping experience. Each shop will be bringing a rack of past styles marked at a steep discount. Help us all make room for our new Fall merchandise in our shops and snag beautiful tops, dress, jackets and more for a steal. Items will be marked 50-80% off! This is a bi-annual event and you won't find discounted prices like this anywhere else. What's better than getting a good deal and drinking beer;) Hope to see you there! Temescal Brewing 4115 Telegraph — look for the pink side door. We are excited to announce our newest art show (opening 9/16/17) featuring the artwork of Mary Morrow. Mary is a true Renaissance woman and has dabbled in all sorts of artistic endeavors and professions throughout her lifetime, including; sewing, acting, set design, costume design, playing music, interior design, and painting. Mary is also the mother of Resurrect's founder Kate. She has been a huge influence on Kate's love of fashion, sewing, and art and was a very supportive force in helpingKate achieve her dreams of opening Resurrect. We are so excited that Mary came all the way out from Phoenix, AZ to present this new art show entitled: El Cielo Y El Infierno (Heaven and Hell). The show will be up at Resurrect from September 16th - November 13th 2017. We will be having the artist reception on September 16th from 5pm - 7pm during Resurrect's 5 year anniversary sale, so stop by for a chance to meet the artist. Growing up Catholic, Mary Morrow was influenced by the nuns in parochial school and their vivid tales of Heaven, Purgatory and Hell. 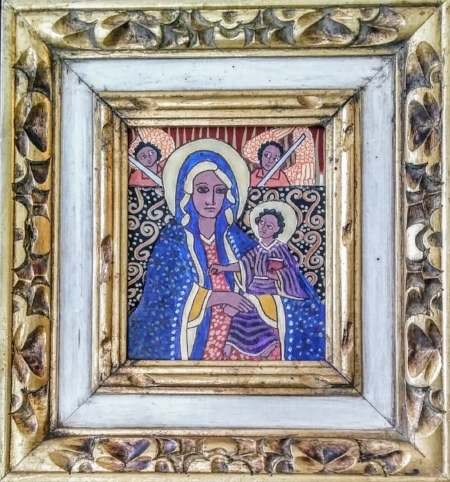 In her early teens, she moved to Addis Ababa, Ethiopa and was introduced to the colorful art of the Ethiopian Coptic Church. As an adult, Mary resides in the Southwest, and has fallen in love with Latin American folk art, Frida Kahlo, Dia de Los Muertos and Our Lady of Guadalupe, whom she considers our Earth Mother. Mary began a collection of over 30 Latin American hand-carved wooden masks on her travels. On a voyage to Peru, she was astonished to find detailed life-size tableaus of saints fully clothed in silver and gold finery. All of these influences continually shape her art and her life. She’s woven them together using painting, fabric, collage, and presented her art alongside several of the masks to create her show, El Cielo y El Infierno. Resurrect's 5 Year Anniversary Party 9/16! We will be celebrating the shop's 5 year anniversary all day (11am - 7pm) on Saturday, September 16th, 2017!! We will be offering 15% off everything in store and online (use discount code: FIVEYEARS. Stop by for a huge sale, refreshments, and some special giveaways. From 5pm - 7pm, we will be hosting an artist reception for our new art show entitled El Cielo Y El Infierno (Heaven & Hell) by artist Mary Morrow. The amazing hand image on our flyer was created by Lea Zalinskis. Check out her website for more visual delights. Resurrect's next art show entitled The Hanged Plant features the artwork of Emily Jane Fuentes and Erica Shapiro-Sakashita. The Hanged Plant will be a combination of woodworking creations by Emily and screenprints plus handmade plants by Erica. These two artists live in Oakland and both share a passion and love for our plant friends. The art reception will take place on Saturday, July 22nd, from 6pm - 9pm at Resurrect 4135 Piedmont Ave. Oakland.There will be refreshments and cold beverages served. We hope to see you there! The show will be up at the shop through September 12th if you are not able to make it to the reception. The Mad Era Collection by Emily Jane Fuentes combines unique wood structures, glass vessels, and curious plants. These novel creations incorporate found, salvaged, and repurposed materials. The artist, Emily Fuentes, is a local woodworker and gardener whose art is a synthesis of these two passions. With deep respect for the earth, she hopes to bring life and art into the home with little to no impact on our natural resources. Erica Schapiro-Sakashita is an interdisciplinary artist based in Oakland. Her work is largely informed by a passion for horticulture, urban ecology, and being a silly woman. Patchwork Show Sat. June 24th 11am - 5pm & Giveaway! Resurrect will be vending alongside +50 other local artists and makers this Saturday June 24th from 11am - 5pm in Jack London Square! This event is free to the public and family friendly. 2) Visit each of our booths at Patchwork (Desiree Salas # 70, Harumi K #35, Resurrect #16), snap a photo, tag us, and share on Instagram (this would be three separate photos, one at each vendor). The deadline to post is 11pm Sun. 6/25, and we will notify the winner by Wed. June 28. Resurrect will be Vending at the Patchwork Show on June 24th! Shop handmade and independent goods from 150+ local makers + food artisans at Patchwork Show in Oakland. FREE to attend and family + dog friendly. PLUS food artisans + trucks, DIY craft workshops and music. Vendors are selected by a jury and feature clothing for men, women & kids, handbags, accessories, jewelry, art, ceramics, garden finds, home goods, plush, crochet & knit items, pet gear, kits & patterns, bath & body goodies and more! Come and view Heather Annaleice Young's latest works, entitled "Where All Things Connect." Heather is a mixed media artist and photographer living in Oakland, CA. She incorporates her photography, vintage/found objects, crystals, animal totems and more to inspire magic and healing in her unique pieces. Check out @whereallthingsconnect on Instragram to get a sneak peak! During the art reception, Heather's sister, Chris Young-Ginzburg will be doing mini tarot card readings and there will be refreshments served. We hope to see all your beautiful faces there! Where All Things Connect will be up until May 16th, 2017. Resurrect is proud to present “Good Omen,” a group show exploring signs of luck, fortune, and magic. Whether through symbols of the occult, personal stories of good luck, or impressions of a dream, we welcome five contemporary illustrators to share their interpretations. Opening reception Saturday, January 21, 2017 from 4PM - 8PM. Wine and other beverages provided. This group show will be on display through March 13, 2017. The Lioness Oracle AKA Alejandra León Wolfe Rocha will be reading tarot at the shop on Wednesday 12/28 from 2pm - 6pm. Come and get you cards read and see what is in store for you in 2017! Alejandra is a professional tarot reader living and working in Oakland, CA. The tarot reading cost is $40 per reading. Make sure you check out our blog to read her monthly forecast to see what the stars and cards have in store for you for the month! Alejandra has been working over the last year on creating and designing her own tarot deck and she will be reading with her newly published deck on the 28th. Hope to see you then! . Botanica is the title of our next art show featuring four local artists inspired by the magic of plants. This new group show features the artwork of Sarah Goldstein, Kelly Hackett, Anastasia Holland, and Simone Rosenberg. The opening night will be Saturday November 19th, from 4:00pm - 8:00pm at Resurrect. Stop by and meet the artists! If you are a plant lover of any kind, this show is not to be missed! This group show will run from November 16th, 2016 - January 15th, 2017. Born in 1990 in Glenwood Springs, Colorado, Sarah (Sam) Goldstein is an artist, designer and naturalist based in Oakland, CA. She holds a BFA in painting from C.C.A.C. and is pursuing a degree in Landscape Architecture at Merritt College. She has also studied abroad at Seika University in Kyoto, Japan. Blending traditional Japanese painting with Dutch-Renaissance mische-technique, Sarah creates subtly layered works influenced by the natural sciences, contemporary design and Zen aesthetics. As a gardener, landscaper and nursery professional, plants occupy Sarah's mind and seed themselves into her paintings. Kelly Hackett is an Oakland based artist. She graduated from the California College of the Arts in 2011. Her paintings and sculptures are the result of investigations into the various types of goo, including but not limited to: algae, glycerine, bacteria, marine life, polymers, plaque, fat, plant material, soap, crusts of all kinds, cosmetics, geological formations, flesh, and wax. Simone Rosenberg is a Bay Area artist. She works in many mediums, including watercolor, acrylic, pen, color pencil, and photography. She is influenced by nature, animals, shamanic journeys, and psychedelia. Simone holds a BA in Pictorial Art from California State University, East Bay. Check out more of her work at simonerosenbergartist.tumblr.com.